Find Better Ideas, Faster ® with a custom swimsuit trend report, our PRO Dashboard and 80+ categories of premium trend reports. The Trend Hunter Swimsuit Trend Report explores the latest innovations within the fashion industry, with a focus on bathing suits and proper swimming attire. We will highlight the rise of positive body image while investigating the most fashion-forward plus size bathing suits. There will also be an in-depth look at the various demographics from trendy toddler swimsuits to tasteful elderly suits. Using Trend Hunter's crowdsourced research, we will expose the best materials and most popular designs being worn by consumers. Professionals working in the fashion industry will find this report to be an enlightening guide to the latest trends and fashion statements being made in the swimwear industry. It will also help retail stores to ensure they are offering the best and most current styles to consumers. 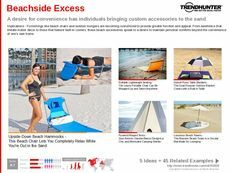 When launching a new line of bathing suits, the Swimsuit Trend Report will ensure you are equipped with the most cutting-edge information for design, marketing and sales.